A couple of hours after midnight this morning, I awoke with a sudden, extreme and ravenous desire for a Clark Bar. Where this came from, I have no idea because I’ve never had one before. Perhaps, as an adult boy-wonder child-man, I had fallen prey to those advertisements aimed at actual children. Whatever the cause, the craving came from the deepest nether regions of my stomach; a place not unlike the ancient Indian caves I found myself in while accidentally in Kentucky—caves that contained evil spirits and stale puddles. The lesson I took from those caves is that when those spirits beckon you, it’s best not to risk ignoring them. Though here, I was just being asked to eat a candy bar, not murder my companion. I calculated that if I revved up the Polaris right away, and traveled through the forest without stopping, I’d arrive in the village by dawn. There, one of the elfin hotels was sure to have some sort of Finnish knock-off Clark Bar, if not the actual thing. But as soon as I made my start out of bed, Ingrid immediately lashed awake, bearing her teeth at me like a rabid wolf. 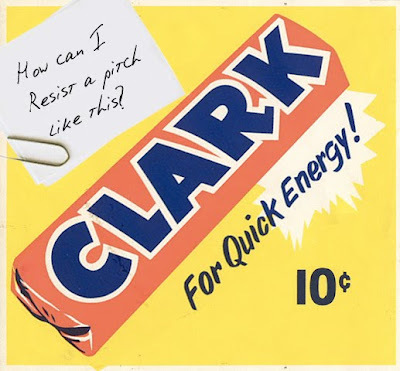 I didn’t have time to explain what a Clark Bar was, nor for that matter Madison Avenue advertising, my stomach, and its ties with ancient Paleoindian caves and pure evil. Instead, I told her not to worry, that I would be home in time for lunch, and I grabbed my parka, thinking the matter settled. But while my back was turned, she tackled me, throwing herself on my back like an octopus. This woman was like more animals than the Bronx Zoo contained. “You’re cheating on me!! !” she mooed. I spun wildly to shake her off. “I’m… just… hungry!” I shouted as she clung, but by then her hands had already clawed inside my mouth for a better grip, and my words were rendered mad howling. She mockingly mimicked my howling as I swung her around until I smashed her into the taxidermied reindeer head that hung on the wall. She and the head tumbled to the ground. I don’t know which scared me more: the lifeless gaze the reindeer gave me then, or Ingrid’s. I made for escape, but somehow she leaped over the bed, barrel rolled in front of the door, and grabbed the skis leaning on the jam in one swift move. I only had time to think Boy, she is really angry! before she javelined one of the skis at my face. I dodged too late, and the recently sharpened edge sliced my nose. I recovered, my nose gushing. She waited for me to approach, tossing the other ski from hand to hand like a switchblade. I calculated my chances, do I go low or do I go high, then chose. I turned and smashed face and elbows first through the window, landing in the snow, desecrating it with my blood. I got up and slogged through the snow toward the snowmobile as fast I as I could manage, knowing she was right behind me, the snow as equal foe for her as for me. Or so I thought. Her low, staccato grunts gained on me, though I refused the urge to look back lest I be slowed and captured. It seemed like an eternity before I mounted my escape, turned the engine over on the fourth try, and started swiftly off into the woods. It was only then that I allowed a peek over my shoulder, expecting to see Ingrid screaming at the northern lights. She was gone! I scanned the darkness quickly, and indeed she was no longer a threat, probably having gone back inside. I sighed relief, then turned to hunker down for the long trip. But there was Ingrid! Facing me, clutching the windshield like an angry koala (which I think the Bronx Zoo actually has). I swerved from the shock and crashed into a pine tree and we were both thrown. As a last resort, I just pretended to be dead, hoping that she would finally leave me alone. Though she shouted concern for my well-being, I continued to hold my breath. She pounced on me, beat on my chest and administered mouth to mouth, eventually forcing me to make passionate love with her. Unfortunately, the Hollywood photogs we hoped to avoid by coming all the way out here soon surrounded us. We retreated back into the cabin without comment. Ironically, I found a whole box of Clark Bars in the kitchen cabinet, as they are Ingrid’s favorite. So I satisfied that hunger. Unfortunately, now I’ll have to deal with my artistic hunger. Because my skis were destroyed, I was forced to withdraw from the Nordic ski dance competition today.